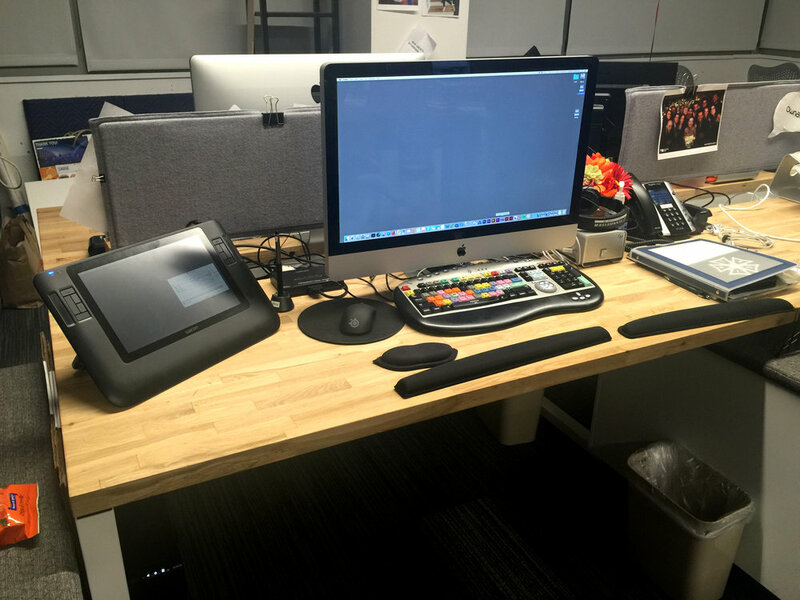 Lead Graphic Artist 4k & HD workstation kit rental. When working onsite you have the option for us to provide our own kit rental systems. Aside from offering design and animation services to the entertainment industry, Rendertank® rents custom tailored graphics systems for television and film production. From one workstation to an entire graphics department, our dependable and fast systems will integrate with your post production network and support your artists. HD-SDI in/out. Compatible with Avid, Premiere and Final Cut systems. Graphic Artist HD workstation kit rental. Streamlined graphics suites with Photoshop, After Effects, Illustrator and Creative Suite. Scanning, clean-up, color correction and logo removal. Wacom Cintiq and Intuos pen tablets. ToonBoom Harmony, Soundtrack Pro, Cinema4D, GenArts Sapphire plug-ins and more. Delivering graphics over fiber channel and gigabit ethernet to Avid, Premiere and Final Cut compatible systems. Department infrastructure and live TV experience. On-set supervision and pre-visualization CGI. Final Draft, Storyboard Pro, Filemaker Pro, and Microsoft Office. Network Servers and RAIDs. Automated back-ups and file transfer services included with kit rentals.